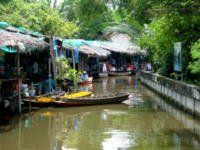 The Sai Noi floating market is a very authentic Thai floating market tucked away on the Phra Pimonrat canal in Sai Noi district Nonthaburi about 30 km from Bangkok’s northern city limits. 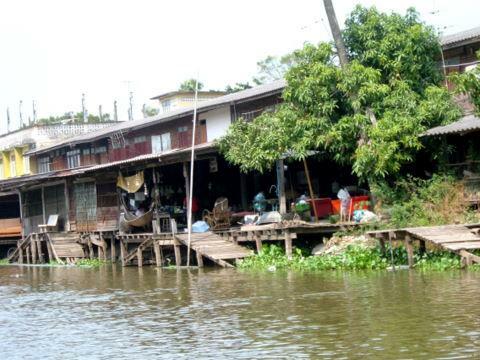 Sai Noi is the district at the northern edge of Nonthaburi on the west bank of the Chao Phraya River. Here the area is less densely built-up than the east bank. The district isn’t even on the tourist maps. 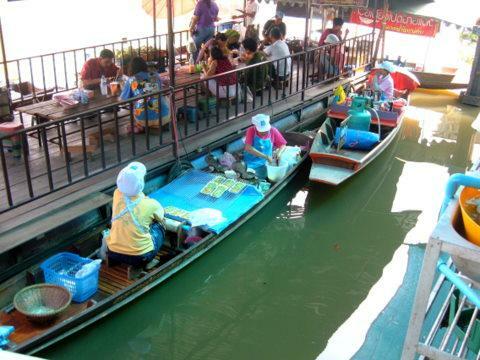 Located next to Wat Sai Yai, this floating market sells various deserts, fruits and cooked food produced by the people in the neighbourhood. Visitors get a chance to see the life style of the canal side community and the natural environment this community lives in. 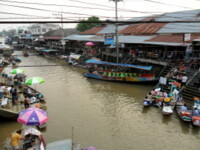 The floating market consists of stalls in the open area in front of Wat Sai Yai, a row of stalls on one canal bank and another row on pontoons in the canal. 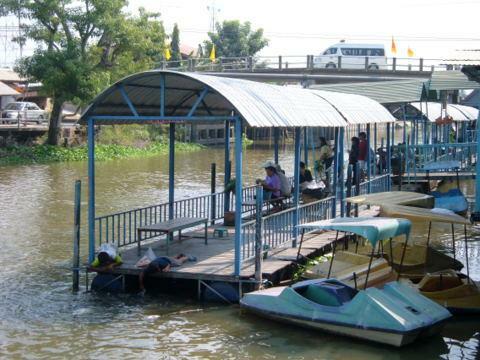 Previously there were no pontoons, only boat vendors. 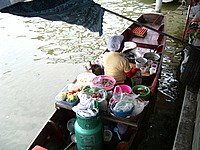 However, I only saw about five or six boat vendors that morning. 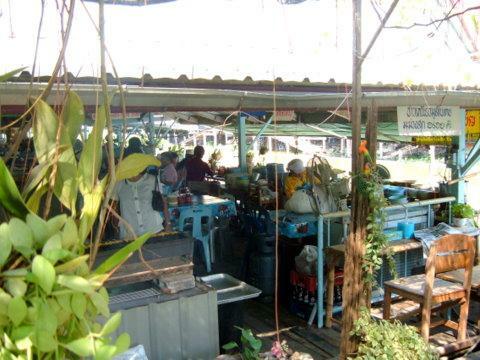 A sluice gate installed by the Irrigation Department along the canal has blocked other boat vendors who live beyond the gate from coming to the market by boat. 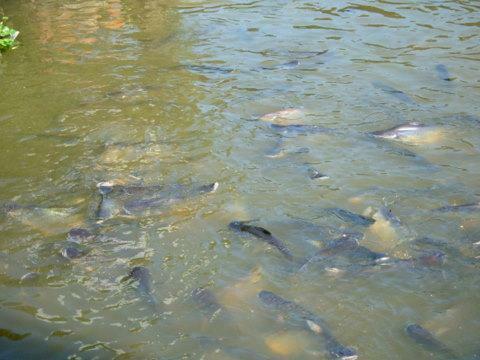 It would be hasty to compare the Sai Noi with Taling Chan or Bang Namphueng. The latter two are bigger and busier with more visitors. 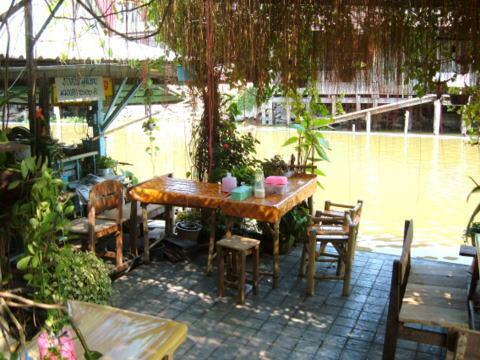 However Sai Noi has its own special feature. 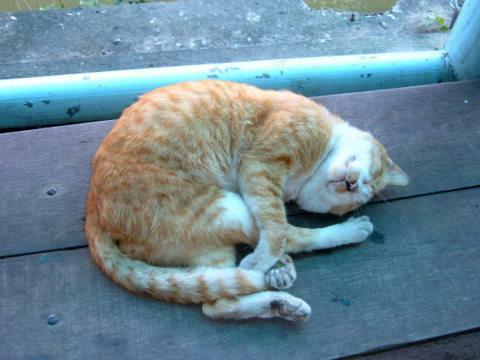 On a late Saturday morning in December, life here had a distinctly leisurely pace. 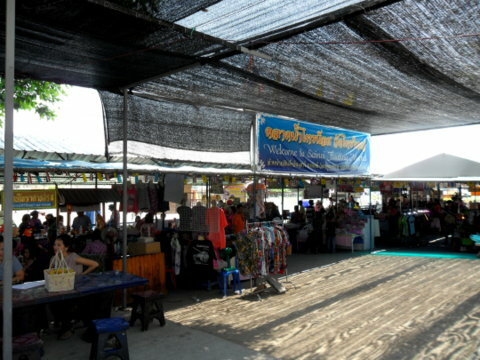 I didn’t have to squeeze my way through narrow and crowded passageways between the vendors. 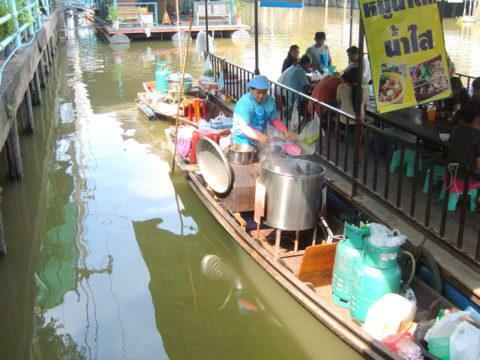 Food vendors on the pontoons have created a dining area with a very pleasant ambience. 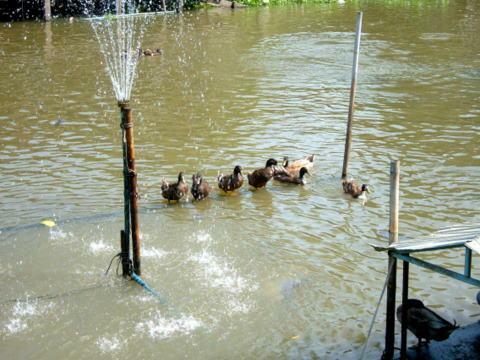 Another section of pontoons has benches for visitors to sit and relax to pass the day or feed the fish and ducks. 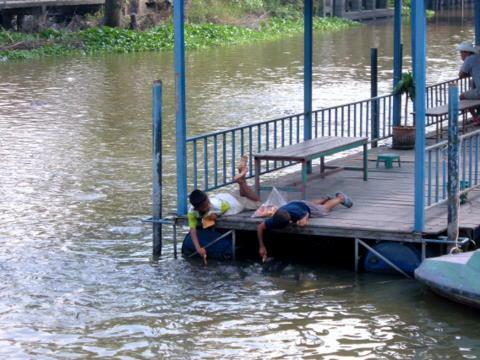 I sat by the canal to have a cup of strong local coffee as I watched these boys enjoy some of the simple things in life. Life by the canal is peaceful and scenic; there are hardly any passing boats. 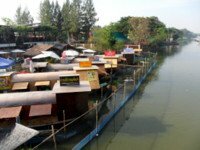 A morning at the Sai Noi floating market is a very pleasant way to spend a weekend away from the hustle and bustle of Bangkok. I just couldn’t help taking this shot through the bus window as we were about to go. 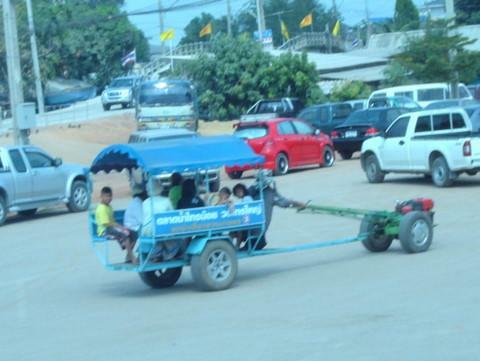 You won’t see this in Bangkok! 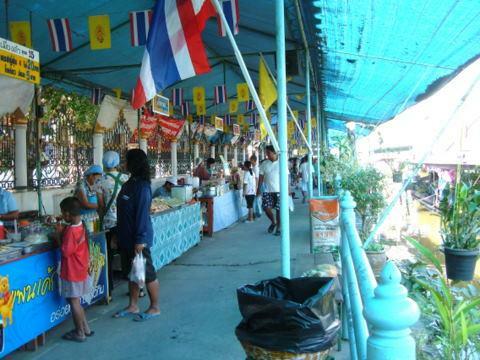 My first visit to the sai Noi floating market was in December 2009. Since then there has been a number of changes. 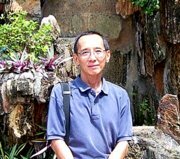 I had a chance to find out when I visited Sai Noi again on 22 April 2012. 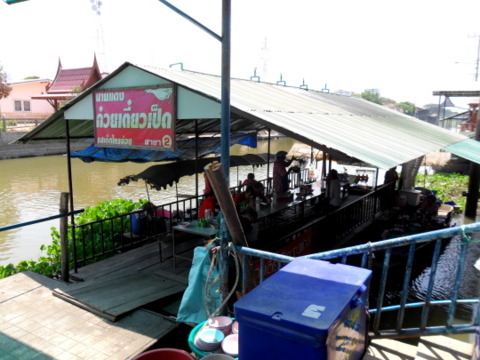 The floating market has extended to the stretch of the canal that’s south-east of the bridge (please see map). 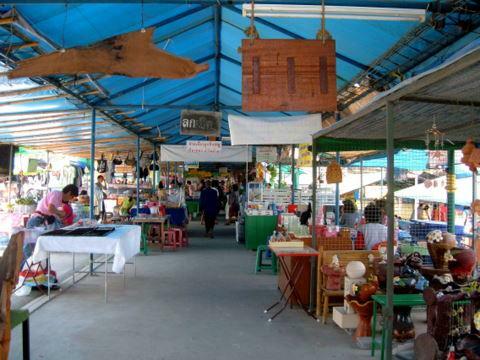 Some parts of the car park have also been taken up by vendors. 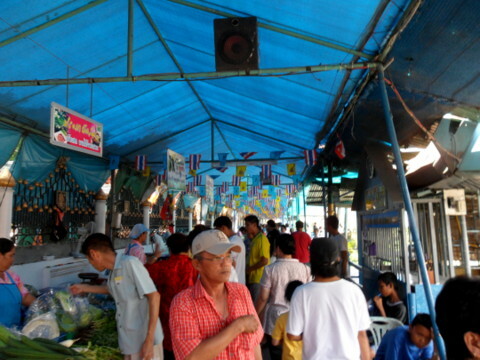 As it was a Sunday, the car park was packed and the market was crowded. This was in sharp contrast to my first visit on a Saturday in December 2009. Another development is the expansion of Wat Sai Yai, a new building is under construction. 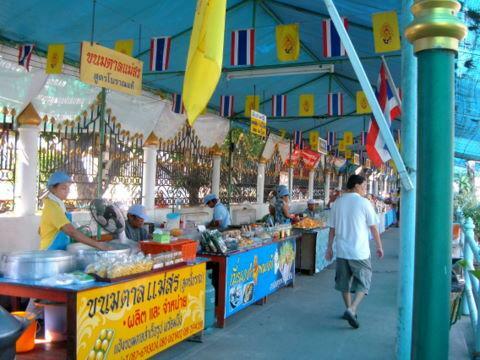 Perhaps with more visitors to the market, there has also been a corresponding increase in visitors to the temple. 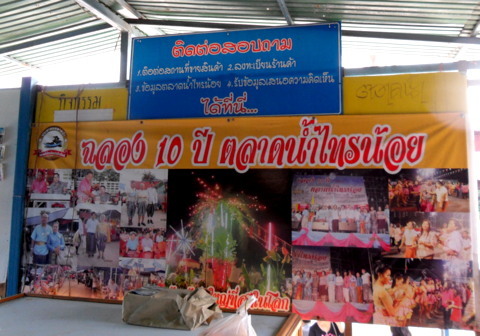 To top it all, the Sai Noi floating market has just celebrated its 10th anniversary. 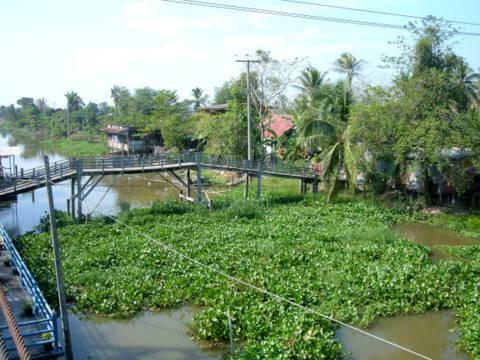 If you are driving, proceed along Rattanathibet Road and cross the Phra Nang Klao Bridge.Continue on Rattanathibet Road till you reach the Bang Kruai – Sai Noi Road on the right. 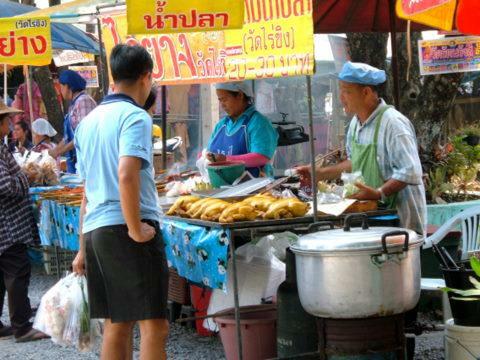 Turn right into the Bang Kruai – Sai Noi Road and carry on till you see the Sai Noi Hospital on the right. 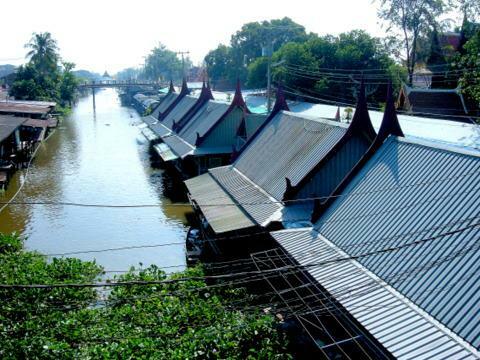 The road to the Sai Noi floating market is on the left after you have passed the hospital. Air-conditioned bus service no. 528 from the Victory Monument. 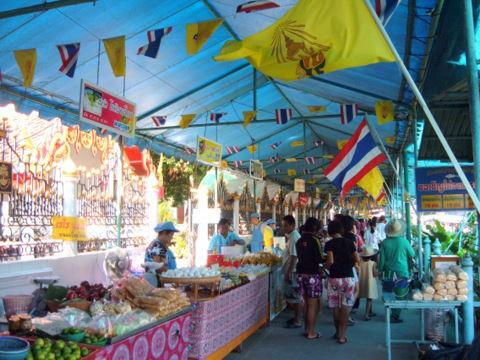 The floating market is open Saturdays, Sundays and public holidays from 8 am till about 4 or 5 pm. It's OK as long as you get there by late morning. 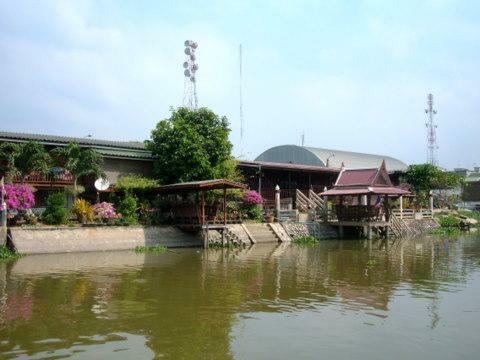 My thanks to the Museum of Nonthaburi for organizing a tour to discover this cultural gem in the province.